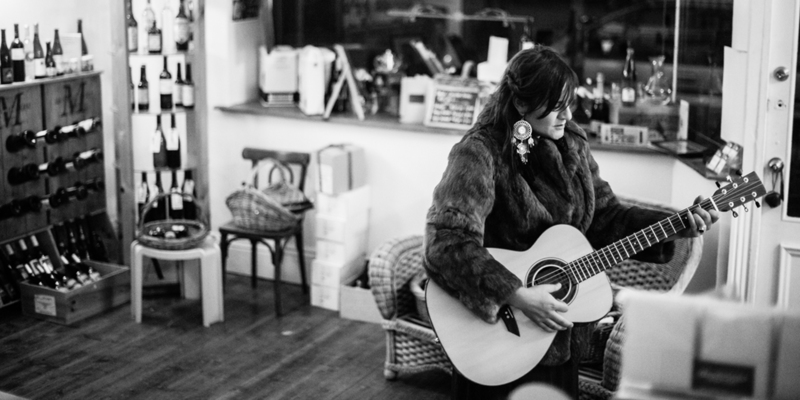 Emily Davis is an insightful songwriter, whose music walks the line between folk and rock. Her cinematic lyrics create a luscious world for the listener, as each song explores human connection, the universal truths we all know but are often too afraid to admit and her enduring belief in the transformative power of love. She follows in the tradition of the strong women of her art form. Her sound is reminiscent of songstresses Brandi Carlile, Emmy-Lou Harris, Jolie Holland and Chrissie Hinde. She has a reputation for ‘utterly absorbing’ (DB Magazine) and ‘breath-taking’ (Rip It Up) live performances. Put simply she knows how to turn a room. Her early life overflowed with opportunities to learn the art of giving an enchanting performance. Her two grandmothers were equally responsible. One immersed her in vintage country mix-tapes, (Patsy Cline, Johnny Cash and Loretta Lynn) on their quarterly road trips from Adelaide to the Eyre Peninsula. The other, Taita, (Lebanese for ‘Grandma’) fuelled her obsession with dramatic live performances by allowing her to watch, on repeat, a VHS of 70s Lebanese Cabaret performers Sabah and Fairuz. Despite these culturally divergent influences, the lasting impression on Davis was profound. If she was going to sing, she had to do so with her heart on her sleeve. Launching herself onto the live Adelaide scene in early 2005, she was quickly snapped up by local management and wrote her first album’s worth of original songs. She reconsidered her pending career as a lawyer, dropped out of university and began preparing her first original release ‘Moving in Slow Motion’, produced by ARIA Award winning producer Monique Brumby in 2007. The debut release received rave reviews, and was on rotation on NOVA, Triple J and ABC National. After taking time off of the road to recover from the tragic death of her father in 2008, she resumed songwriting with a deeper sense of profundity, releasing her darker alt-country album ‘Undone’ in 2011 to similar critical acclaim. Emily has toured extensively across Australia and performed at festivals WOMADelaide, Peatsridge, Fleurieu Folk and Semaphore. She has supported artists such as CW Stoneking, Clare Bowditch, The Audreys and Kate Miller-Heidke Renee Geyer, Vanessa Amarossi, James Reyne, and Richard Clapton in some of Australia’s finest venues. Her latest release, ‘You, Me & the Velvet Sea’ is a deeply personal album focussed entirely on love, in all of its incarnations. After a dramatic end to a long-term relationship she threw herself into deep contemplation of the meaning of love, and in doing so found these songs and herself. Davis enlisted the talents of Holly Thomas (Drums), Annie Siegmann (Bass), Tori Phillips (Fiddle) and Emily Smith (Guitars) to bring the songs to life. Inspired by The Dirty Three, and storytellers such as Brandi Carlile and Jolie Holland, Davis used dynamic electric guitars, epic floor toms and thudding bass to set the soundscape for her poignant and sometimes sassy lyrics. Combining aching fiddle and super sweet four-part harmonies, the songs are propelled forward. And, front and centre, Davis’ delivers her evocative lyrics with a syrupy voice; which despite being a little older and wiser, resonates with an honesty and warmth that she is renowned for.